We have our first division champions! The Belfast Trojans remain undefeated in the Shamrock Bowl North and their now 6&0 record gives them enough to claim the SBC North crown. Meanwhile an unpredictable SBC South means the three remaining teams have it all to play for. In IAFL-1 the league is still close with just a few games played but some teams are beginning to look a little more dominant. A beat up Knights side, who had some players playing all three of offence, defence and special teams, put in a strong performance to keep the Trojans to their smallest points difference of the year but in the end Belfast did what they do and kept on rolling. 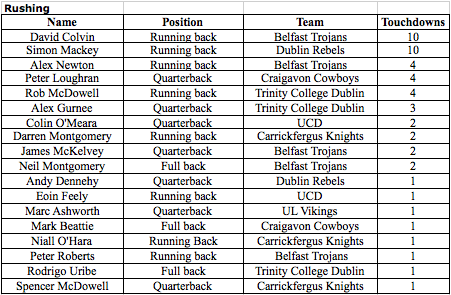 David Colvin took his rushing touchdown total to 10, equalling season-long leader Simon Mackey of the Dublin Rebels at the top, taking the ball in from 20 yards out. The experience of the Carrickfergus defence and the strength of Belfast's defence then took over, keeping the score at 7-0 for an extended period of time before Alex Newton broke numerous tackles and ran 40 yards for the second Belfast score. Newton would score his second of the day, and fifth of the season (one being on special teams), from close range to give the reigning champions a 21-0 victory, a 6&0 record and back to back division championships. UCD come out dominant winners of the "Colours" derby match less than a week after these teams played together against NCAA Division III Ohio Northern University. This win opens up the SBC South, but still leaves Trinity in the driving seat due to their two scheduled remaining games being against the now defunct Cork Admirals. 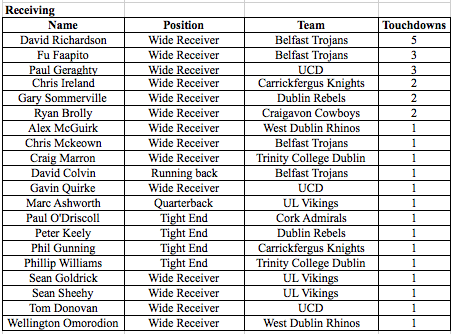 The Vikings cannot catch Trinity now, due to TCD having the better head-to-head record, but if UCD beat UL twice in their two remaining games then they would be crowned South Champions. UCD quarterback Colin O'Meara had a big game, throwing two touchdown passes (one each to receivers Paul Geraghty and Gavin Quirke) and rushing one in himself. Running back Eoin Feely grabbed a touchdown too, giving him his first of the season. The Trinity defence seemingly couldn't deal with the high octane option offence that they did so well against earlier in the season. Injuries? Fatigue? Even a spot of complacency? And that is no disrespect to UCD as this dominating performance is the kind of win that could swing a season, giving them clear momentum down the stretch. In Double Coverage's Irish football preview on Saturday we predicted that Coach Drake of the Bulldogs will have drilled his offence after it somewhat stalled in their opening two games and that they'd open up more on the Phoenix. They certainly did that! The experienced Phoenix couldn't stop Meath enjoying their first competitive home game at Navan Rugby Club. Bulldog brothers Pete and Eddie McMahon both scored a touchdown each with running back Pete rushing one in whilst older sibling, and quarterback, Eddie hit tight end Steve Daly for a score. But the Meath defence had its day too, with middle linebacker Mark Lynch picking off Erin Kelly and taking it to the house for six more. Having previously only played in DV-8s the Meath kicking unit is in its infancy, but they grabbed their first ever PAT during the game, an added bonus for the extra time spent drilling it in training. 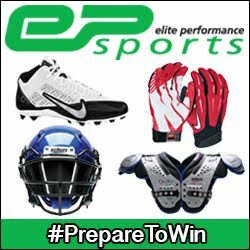 Meanwhile the Phoenix scored an impressive touchdown with quarterback Erin Kelly hitting Jordan Reid for a short pass before the receiver took the ball to the endzone for an 80 yard score, but the Bulldogs were not going to be denied on their first home game. The Bulldogs now own the stingiest defence in Irish football and sit third in the IAFL-1 whilst Tullamore has the same points and are still only a win away from the top of the division.